Pros: Well-acted, clever, and delicious. Cons: You will get hungry. An endearing show with a very tasty reward at the end. The E5 Bakehouse – an actual bakery – is playing host to a very lovely and enjoyable evening of theatre. 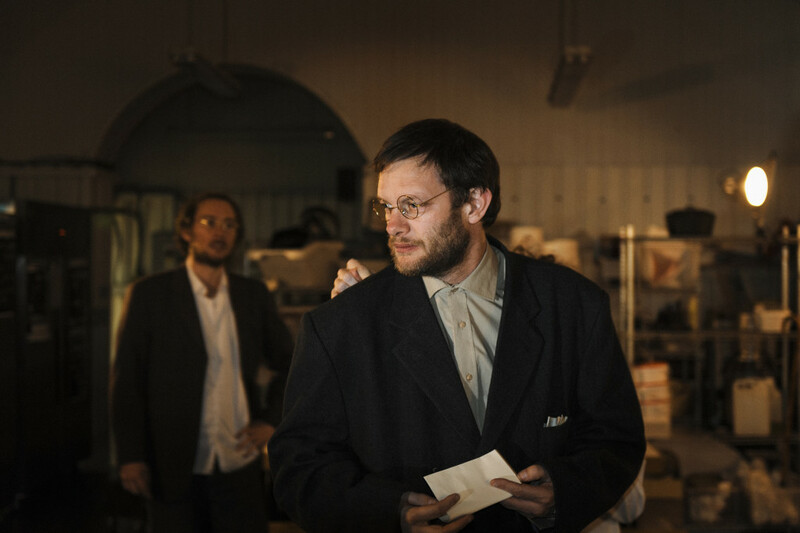 It takes place over two parts—first, a performance of an adaptation of Knut Hamsun’s Hunger, and then a Scandinavian style meal. The play is a tale of a man who is teetering constantly on the edge of survival. He is determined to be a writer, and to succeed at only that – but yet his tunnel vision causes him to frequently be homeless and unable to feed himself regularly. The play is a study of his descent into a state of near madness as his pride battles with his constantly empty stomach. 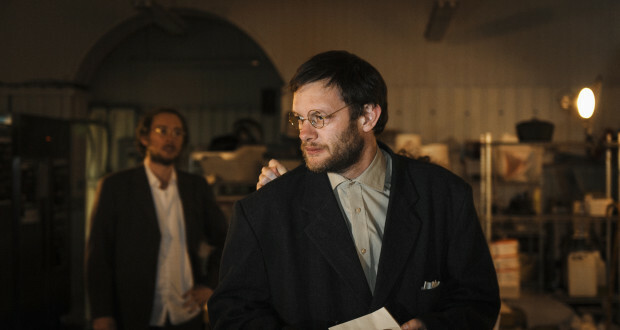 The play takes place in a cozy back room in the bakery, where a mix of picnic and dining tables await for us to sit on. The tables surround an area for a stage, which is minimal in nature. Rustic and simple furniture sits in the stage – a rough bed/bench, and a rickety table and chairs. This serves the subject matter well for all locations needed—and most of the play involves the characters staying on their feet and moving around, often in circles, which adds to the cyclic nature of the play. The casting is lovely – Andrei Ionescu is funny in all of his roles, and Harriet Green is light, lithe and charming. The most interesting aspect of casting is that the main character of the novel is played by two men. Each actor plays off of the other wonderfully, and is aware of the presence of the other. It brings a very schizophrenic approach to the mental decline of the protagonist as he becomes hungrier and hungrier. Whilst both actors brought the character to life admirably, I found that I tended to find it natural to compare and pit their performances off of one another, and was drawn to the performance of Hugo Thurston the most. His eyes never meet the audience; they gaze vacantly over the heads of those assembled. He lives in the role, and acts out despair pitted against pride in an energetic and empathetic way. My dining companion felt differently, and instead thought that each actor represents entirely different characteristics of the character – for example, only Thurston‘s character ever interacts with the love interest. Jamie Harper’s side of the character is most interesting in the scenes in which the man cannot bear to accept charity for fear of denting his pride— Harper portrays such a sense of disappointment at the refusal to accept help that you wonder if he is the side of the man who chooses survival over pride. It’s heavy subject matter, but the scenes are interspersed with songs and guitar, and the evening has a very cosy feel to it. Towards the end of the show the hunger becomes not just a feeling demonstrated on stage, but also a feeling in the stomachs of the audience. Just in time, the play comes to a rather lovely conclusion, and out comes a bottle of schnapps for the audience. This is followed by delicious Scandinavian fare of soup, beetroot, cheese and wonderful baked bread. The audience can then chat whilst the actors do a wonderful job of serving. There is a tasty cake to finish it off, and I’d like to say that as I happily and contentedly walked out of the little bakery that hunger was the last thing on my mind – but full as I was, the subject matter of the play stayed on my mind for quite a long time. Author: Knut Hamsun, adapted by Jamie Harper. Works in soap marketing. Emily is a British American Graphic Designer, serious Tube Geek, and football fan living in South West London. The only real experience Emily has with drama is the temper tantrums she throws when the District Line isn’t running properly, but she is an enthusiastic writer and happy to be a theatrical canary in the coal mine.